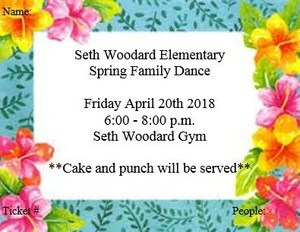 Spring Hawaiian Dance (4/20/18) tickets are still available through your child's teacher. Only ONE ticket is needed PER FAMILY! Once you send money with your child, they should be bringing home the ticket! If you have sent money, and have not received the ticket back; Please get in touch with me so that I can track down your ticket! They will be available to purchase through teachers or the office until next Thursday (4/19) they will also be available to purchase at the door on the day of the event (4/20).